Summer Reading Program Shows that are Magical, Interactive, Age-Appropriate, Laugh-Filled, and FUN!! Books can transport readers to other times, places, and even different realities! 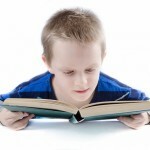 Books can help you grow as a person – inspire you, challenge you, and educate you. In short, books are awesome! Of course, if you’re reading this webpage, you already know that! 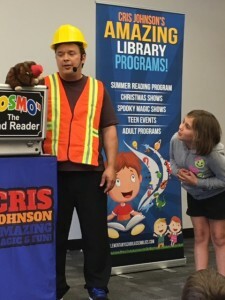 I’m Cris Johnson, and I’m a library performer. I use magic, comedy, music, games, and audience interaction to hold the attention of any age group: kids, families, teens, young adults, and adults. While the majority of my library clients bring me in every year for Summer Reading Program, I also offer incredibly engaging presentations for other times of the year that are guaranteed to fill your library with patrons starving for books! Using a combination of music, magic, age-appropriate humor and interactive fun, I guarantee your guests will be captivated from beginning to end! I understand kids and, perhaps more importantly, I know how to relate to them. I use clean, age-appropriate humor and amazing magic skills help keep kids focused on the theme of my presentation. However, I don’t believe that a successful show means the kids are yelling and screaming the entire time. First, that’s not good for my blood pressure! Second, because my shows have structured highs and lows, I guarantee that things never get out of control! Additionally, I use a ton of audience participation! It’s more fun for the kids and besides, they can “watch” a TV show. With me, my audiences become the STARS of the show in ways that are safe and appropriate. I’m truly honored by how many comments I get from parents complimenting me on how well I work with kids. I’m pleased to report that I book about 250 shows a year in multiple states so what that means to you is…better call right away to see if I’m available for your library! I service libraries primary in Western New York as well as a few parts of Pennsylvania. Basically, I currently work in a 3 and a half hour ‘circle’ around Niagara Falls, NY, so if that’s where your library fits, call me. Best of all, if you have other libraries in your system, I offer discounts for multiple bookings on the same day and the same area. Librarians who know me trust me to always put on a great fun show that emphasizes books. I’m pleased to say that I’ve been doing this professionally for nearly 20 years and I have no intention if slowing down! Call me at (716) 940-8963 (that’s my cell phone) and we can talk about your library. You can also email me at cris@elementaryschoolassemblies.com. I look forward to hearing from you! 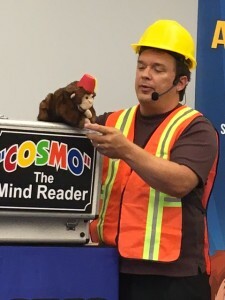 Below is information on my “Spaced Out Magic Show,” which is designed to promote the 2019 Summer Reading Program Theme of “A Universe Of Stories!” Be sure to check back around the fall of 2019 to see what I’ve created for the 2020 theme! The Spaced Out Magic Show! 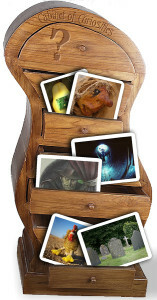 This fun library show features magic involving magic, comedy, science puzzles, and lots more. I’ve created an exciting and wonderful show just right for children and their parents who love to come to the library. Using a Wacky Teleportation Device, kids cause milk to transport across the room, gross Martian Juice is created from one child’s shoe, a drawing of a Space Alien comes to life, and much more! 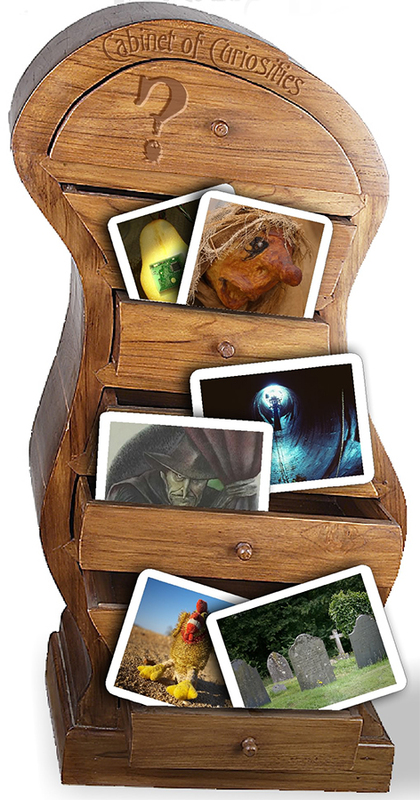 On top of all of that, I reference specific stories and books as a way to generate interest in this year’s theme. I even show up dressed in an astronaut’s uniform! My long solid experience in performing library magic shows all over New York gives me the expertise to present a truly strong presentation. Kids and parents alike are always amazed at the fun magic, laughing at the silly antics (I make myself look pretty goofy at times) and enlightened by the educational stories. PLUS each child attending your library’s show will receive a FREE magic trick!! If I’ve never visited your library before, rest assured, I’m the easiest performer you’ll ever host! I bring my own tables, my own PA system and microphone, and come prepared to present the show virtually anywhere! My set-up time is around 20 minutes so I can come in quickly, draw a big crowd for your event, and leave the audience hungry for stacks of books…all while you set back and relax, because I don’t need or expect any kind of ‘star treatment’ or hand-holding. You’ve got enough to do, so when I come in, you don’t have to lift a finger to help me prepare for my show. Don’t forget – if for any reason you are unhappy with the quality of my performance, you pay nothing…and I’ll even donate $500 to your library just for wasting your time! Try finding another library presenter with THAT kind of guarantee! Don’t worry though: in nearly 20 years of professional work, no one has EVER taken me up on my guarantee! Email Cris for full details! 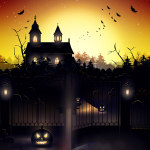 “Spooky Magic” – A Fun-Filled Family Halloween Magic Show! For any group that enjoys the innocent fun of Halloween, this is the perfect show for your event! Click HERE for more details! 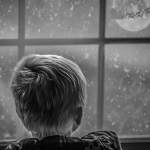 “Christmas Magic” – A Fun-Filled Family Christmas Magic Show! In “Christmas Magic”, school assembly presenter and magician Cris Johnson presents fun magic tricks wrapped up in holiday cheer, and tied with a comedy ribbon! Click HERE for more details! “I Love to Read” – A Fun-Filled, All-Purpose Reading Appreciation Library Show! A Fun-Filled, All-Purpose Reading Appreciation Library Show! Perfect for children 5-12 and any fun-loving adults! Click HERE for more details! 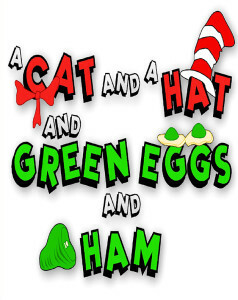 Kids help Horton HATCH an egg, turn a green cloth into Oobleck, see a Cat In A Hat magically change into a Thing, see a drawing of the Cat come to life and more! Click HERE for more details! Could you use a great program for Young Adults? Sure you could. Do you want to draw more teens into the library? Sure you do! A Spooky YA/Teen Library Program featuring tales & artifacts pertaining to Jack The Ripper, Lizzie Borden, Voodoo, Sinking of the Titanic, and MORE! – Click HERE to learn more! 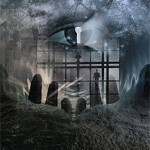 A GHOSTLY YA & Adult Interactive Program that features tales of haunted locations in New York State. 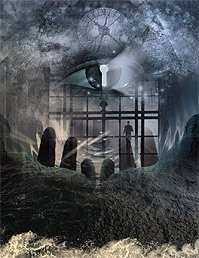 Guests will handle strange artifacts and may even witness evidence of a spirit! Click HERE to learn more! 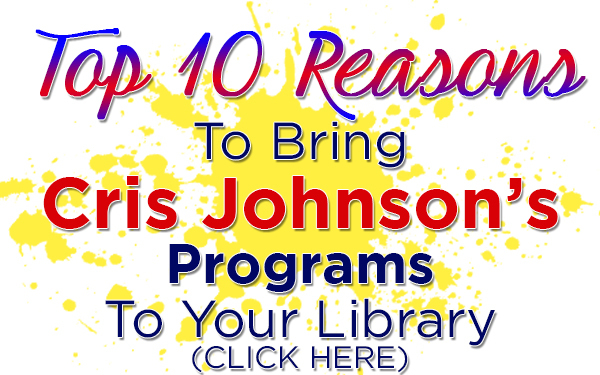 Read important Information About Cris Johnson’s Library Programs. “Cris Johnson’s building and construction show had great enthusiasm and had many of the children laughing the whole show! Many of the library patrons expressed how much they enjoyed the show and thought it was a great time for the whole family! It was a pleasure working with Cris and the communication was super and professional. We would love to have Cris again at our library! thank you so much!